Discover Jesus In Every Book of the Bible Jesus isn’t just found in the gospels of Matthew, Mark, Luke, and John. His presence can be felt throughout the whole Bible, even in Genesis. 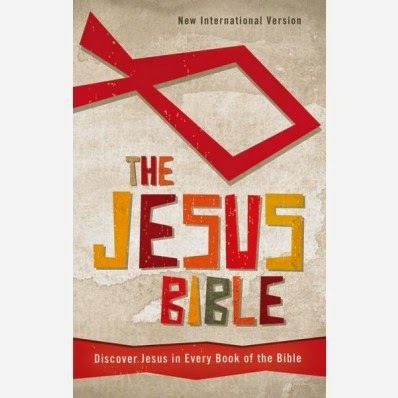 The Jesus Bible contains the complete New International Version (NIV) with daily study helps that point to Jesus and show how he fulfilled the prophecies for the Messiah found in the Old Testament. A perfect way to see the overarching narrative of the Bible, The Jesus Bible includes these features: Presentation page for personalization and gift giving Book introductions explain where Jesus appears in each book of the Bible 365 devotions revolve around the “sightings” of Jesus in the Old Testament and his life and teachings in the New Testament Application notes to help apply Jesus’ teachings to real life today Hundreds of clues highlight the promises/prophesies made about Jesus in the Old Testament and the fulfillments in the New Testament Index of the Old Testament prophecies fulfilled in Christ List of Jesus’ miracles and parables Timeline of Jesus’ life Lineage of Jesus Concordance to help find key topics, people, and events in the Bible Words of Christ in red. I love how this Bible helps young readers see Jesus in every aspect from the Old to the New Testament. Isn't that what the Bible is about? Sometimes it is easier to have some 'help' in finding these special occurrences of Christ when you are just a new believer. This Bible is awesome at helping them on their journey to recognition of Jesus in all things. Last minute crafting before baby..